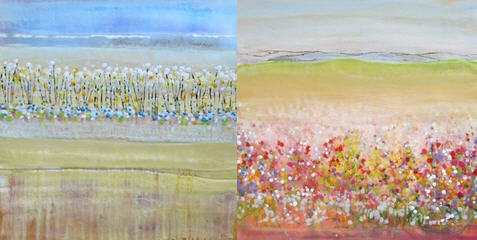 We are enjoying our last week with Cindy Lucas as our featured artist! Stop by and see her work! While we'll still be carrying Cindy's work, this Friday at Second Friday Artwalk, we'll be introducing Peg Bachenheimer as our featured artist! Peg Bachenheimer’s paintings show her love of color and texture which she uses to express her experience of the timeless beauty in the world. Peg paints using thick, many layered oil paint and also hot beeswax encaustic. She divides her time between the two mediums which act to inform each other. She works intuitively and builds her paintings from an initial idea into whatever the painting itself seems to want or need.